Constructed of high quality eco friendly bamboo in 3-Layer overlapping joins, solid extremely to ensure no Warping, Cracking or splitting. 0.7" (18 mm) thickness, 4:3 width height ratio, nice arc shape and applied juice groove. Less moisture absorbency, durable and long-lasting. Natural beautiful finish, FDA certificated. Make cutting fruits and vegetables in your kitchen more stylish with the Surpahs Arc Juice Groove 3-Ply Cross-Laminated Bamboo Cutting Board. This beautifully crafted cutting board has an elegant arcing base design, and a deep juice groove - allowing you to prevent any mess during food prep. 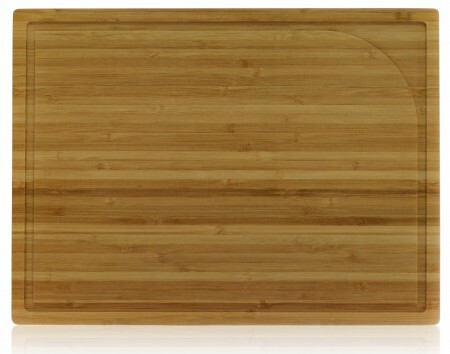 Harder, more durable, and lighter than traditional maple, this bamboo ultra-thin cutting board is the perfect choice for any family. Unlike Maple and other traditional woods, bamboo is also less moisture absorbent, prolonging the life of your cutting boards with proper care. NOTE: It's normal that some tiny bamboo "hair" may appear on the surface after several washing and dry, because Surpahs bamboo cutting boards are made with 100% eco-friendly natural bamboo. These "hair"are completely harmless natural fibers and cause no problems whatsoever. For best maintenance, it is always a good idea to apply for mineral oil to the surface once a day for a week, then do it once a month. Cutting Board Measure 15" x 11" x .7"
Please do not place in dishwasher.